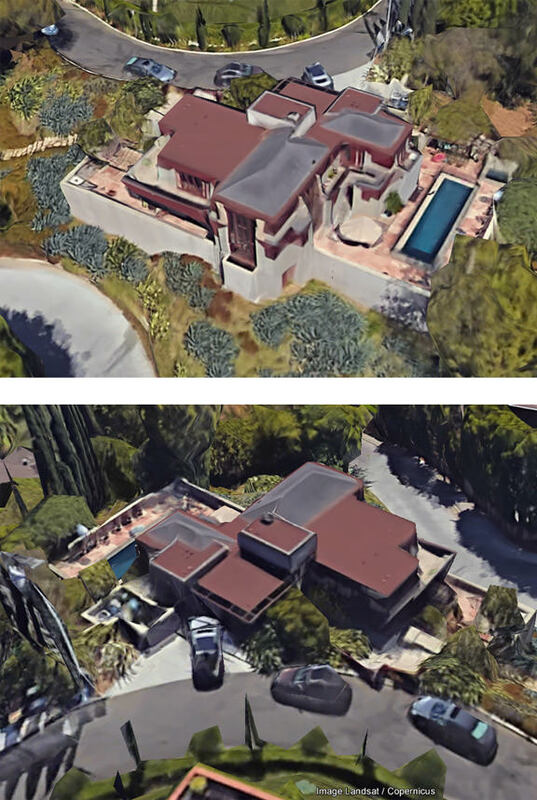 There are lots of interesting photos of before/during/after on this contractor's website showing their work on FLW's La Minatura, and also Lloyd Wright's Taggart House. Most of the completion photos and all (as nearly as I can tell) of the construction photos are of the addition Lloyd built a few years after the main house. I don't know the history, hence the difference between the initial phase and a subsequent addition, but I guess perhaps an addition might've been the cluster of forms closest to the garage (the uphill side) ? 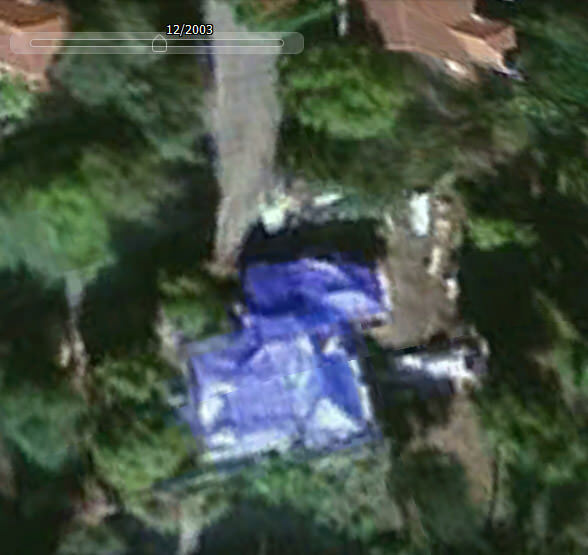 In any event, a Google Earth image from 2003 shows the entire shooting match covered with a big, blue tarp. It's a fascinating house, which I haven't previously studied. I'm particularly taken by two the photos included on the referenced website: one is the newly constructed house sitting alone without neighbors. And then there's this wonderful stair sequence leading down to the lower level living room. It's marvelous now, and was particularly marvelous in this original photograph (shown on the website). When La Min was built, the original lot had just one geometric point touching Prospect Crescent. The original 1-car garage was built on an easement on the neighboring property, which had a house on it. 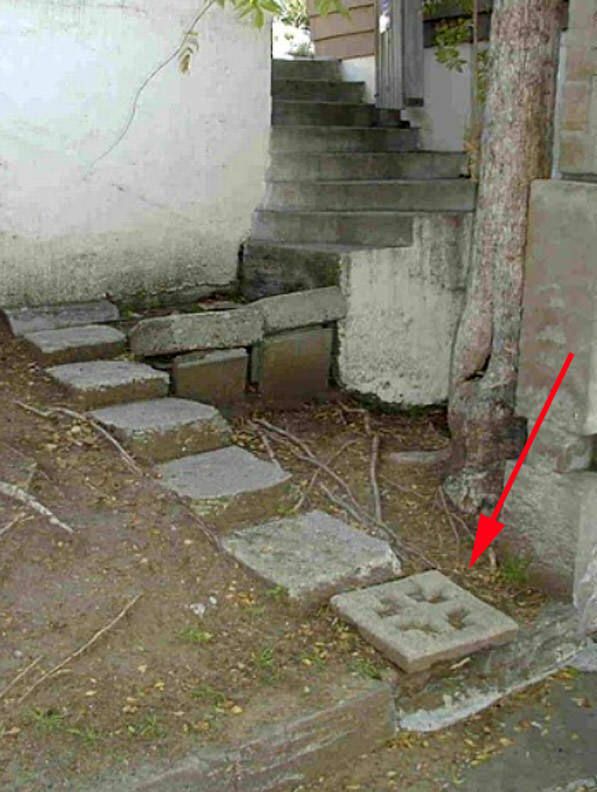 That situation was also the reason that there was an access made from the main entrance terrace down steps to the back yard; it was intended to be closed off. The house next door burned, and Alice Millard bought the property (plus some vacant land to the NE up to Prospect Blvd). 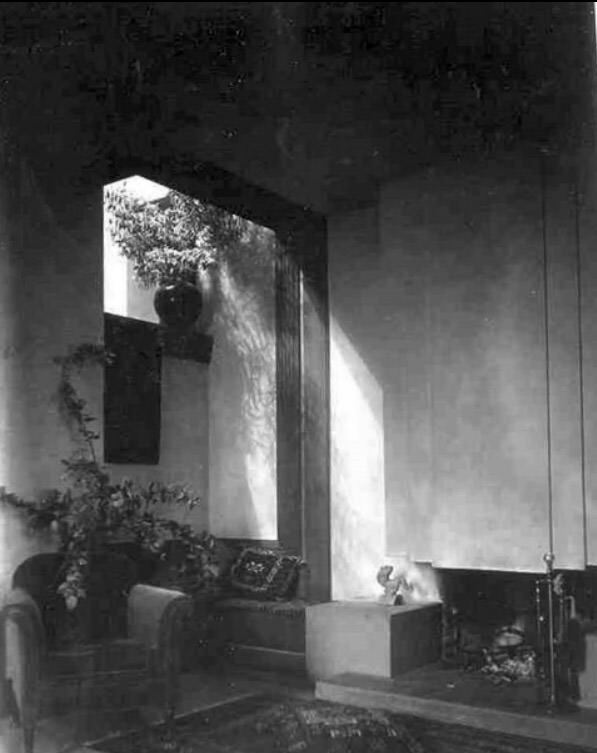 FLW designed some rental structures to be built on the land, plus a large studio SE of the house on the original plot, connected to the house by a bridge to the landing of the exterior stair, at the level of the living room. None of that came to fruition. 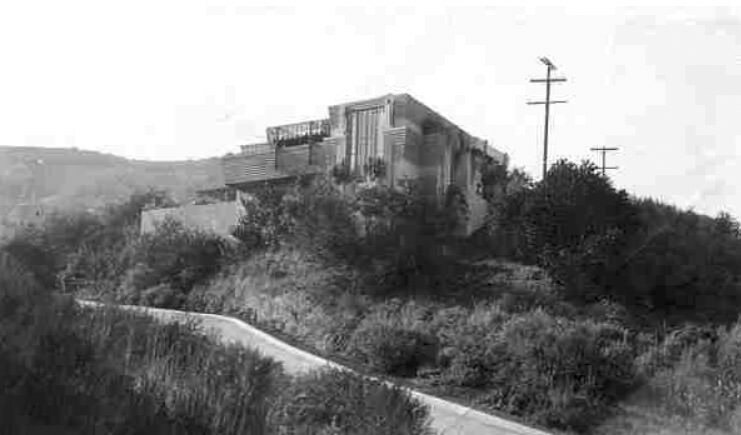 In 1926, Lloyd designed the existing studio and added the second stall to the garage. Both structures at La Min look great. If I had my druthers, the bridge that connects the studio to the house, added by Lloyd in '26, would be deleted. It mars the garden façade of the house. I would also close off the opening near the front door that leads to the garden in back, which violates one of Grant Hildebrand's maxims. What do you know of Taggart? As an Angelino I presume you've seen it repeatedly over the years. Did you get up close when it was in a state of rot and disrepair? have you been inside? I'm also curious about the odd decorative paver that seems randomly located. (its pattern is reminiscent of La Min's which came later). Were there things like that scattered about? Yes, it's the La Miniatura pattern. The block in the pier comes from Storer; it also shows up in the pergola, in the 40th of the Existing Conditions photos. Lloyd apparently had a hand in all the block houses. His father was in town to build La Miniatura and left Lloyd in charge of the other three when he moved back to Wisconsin. I don't know if he moved blocks from those sites or reused the molds. Correction: that paver is from Storer; La Miniatura uses a similar but distinct cross design. This fits with the fact that Lloyd was in charge at Storer but not at Millard. One story (which the reader may take or leave) is that he offered yet another version to the Freemans, who turned it down because they were Jewish. I'm slow catching this train (probably ground previously plowed on WC) but now I read that it was Eric Lloyd Wright who served as the restoration architect. How poetic ! He did a grand job of it and I'm sure it was a labor of love and probably very fulfilling for him personally to bring back this masterpiece. No wonder the recasting of the family blocks was so lovingly done. All just Family Business. James, I have been by Taggart many times. One passes it on one of the approaches to Griffith Park. It has been years, however, so I never saw it in disrepair, just a state of shabbiness. I have never been inside.